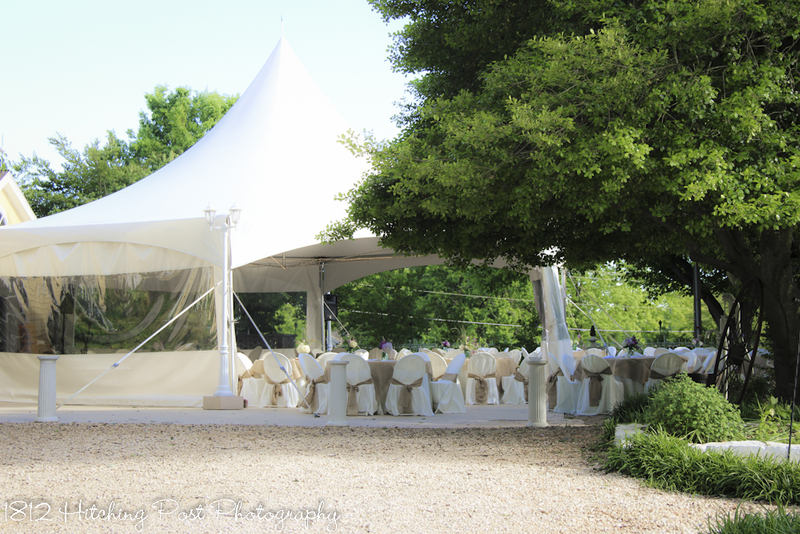 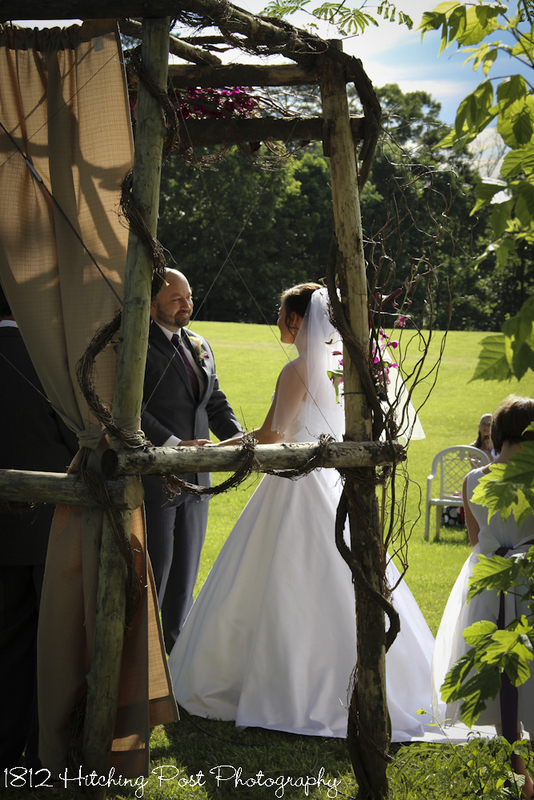 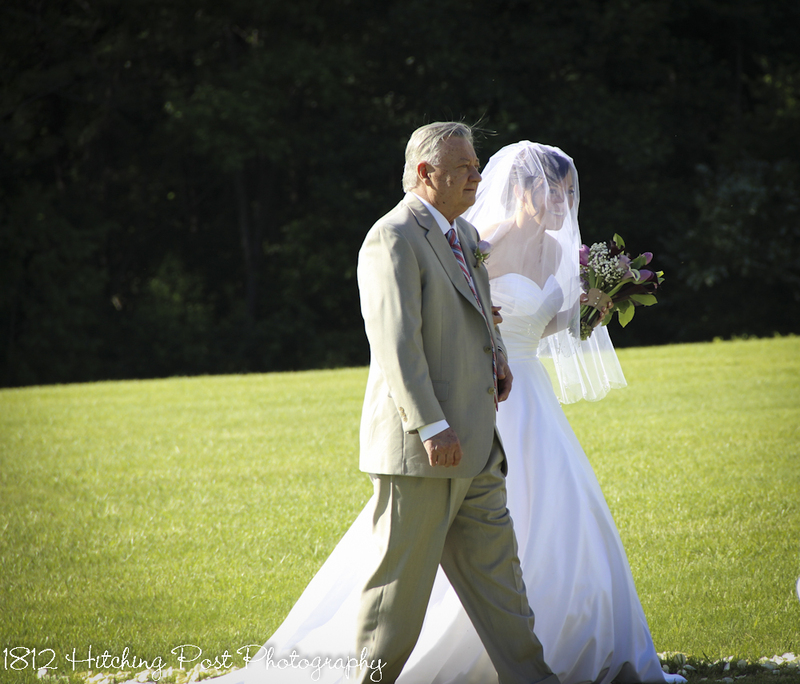 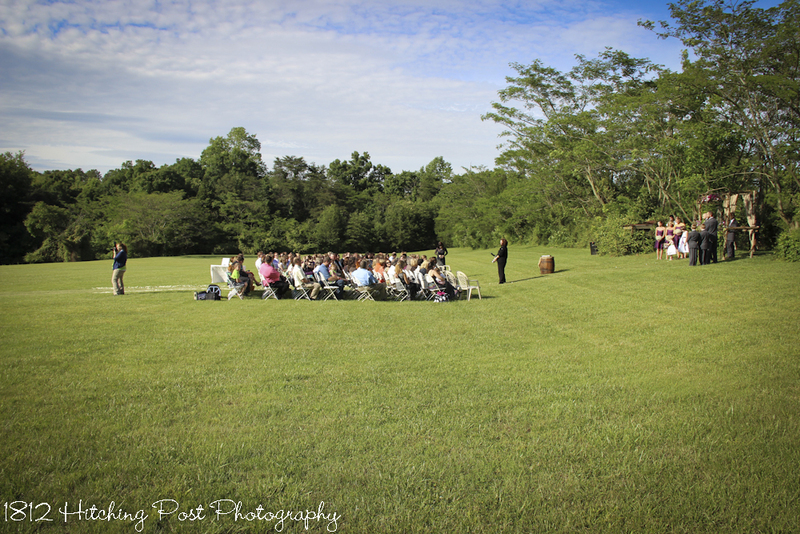 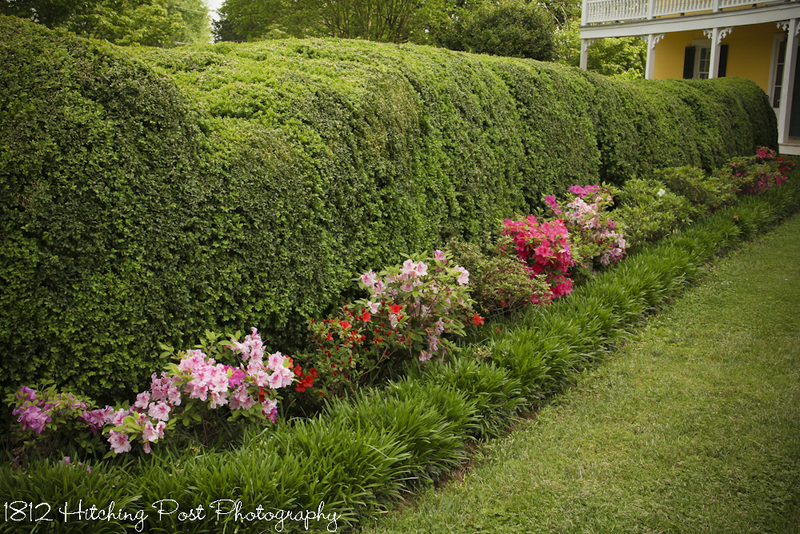 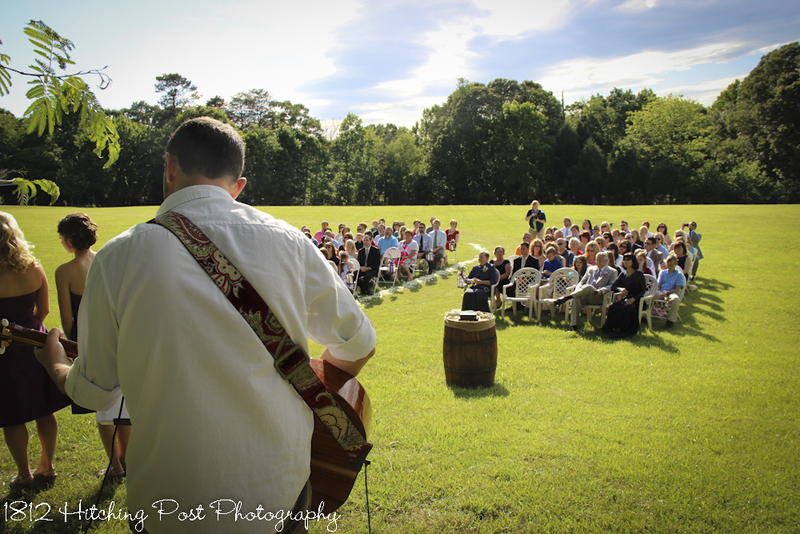 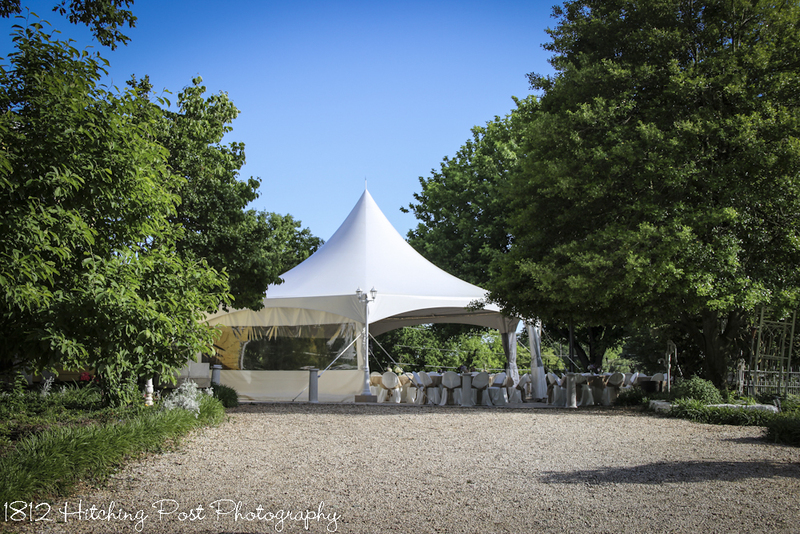 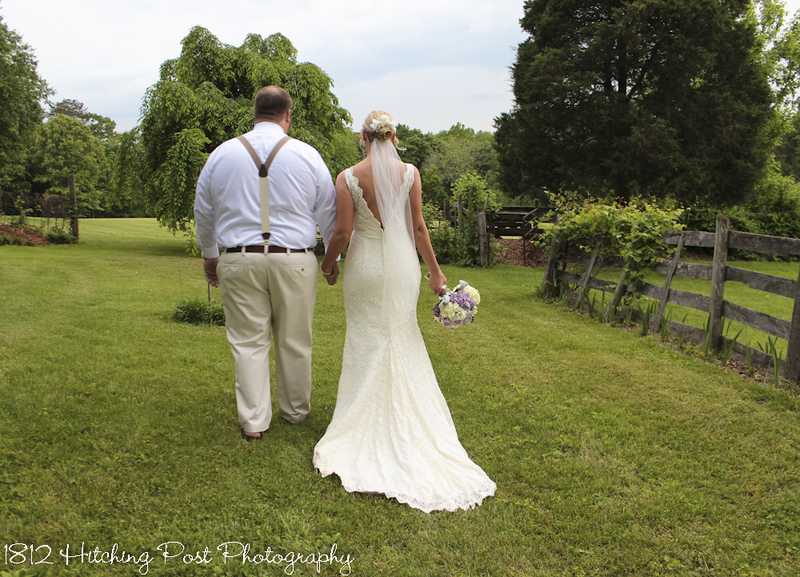 Valerie and Jason chose the lower field for their late May ceremony with 110 guests in attendance. 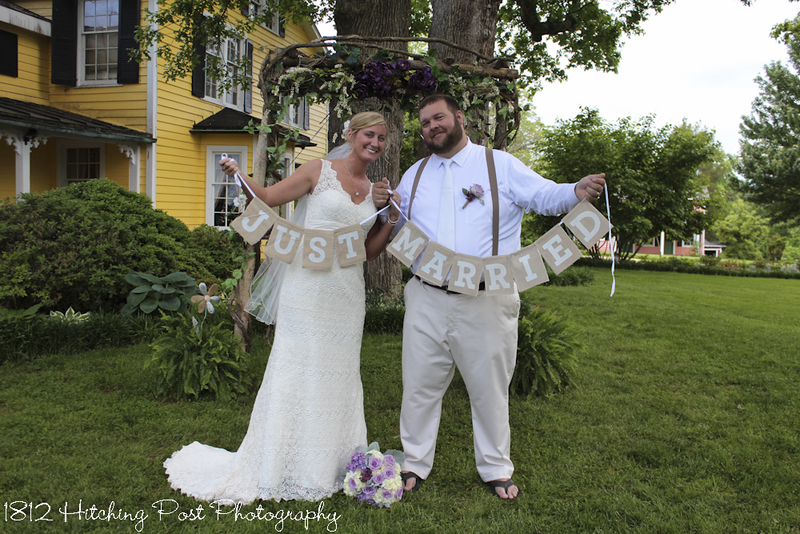 The wooden arbor was decorated by Desi’s Floral and Design Studio. 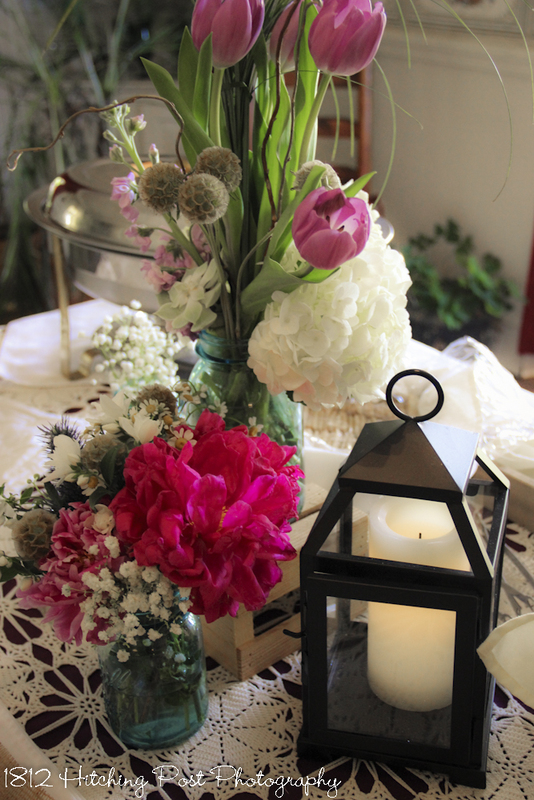 Desi also provided the bouquets and gorgeous centerpieces. 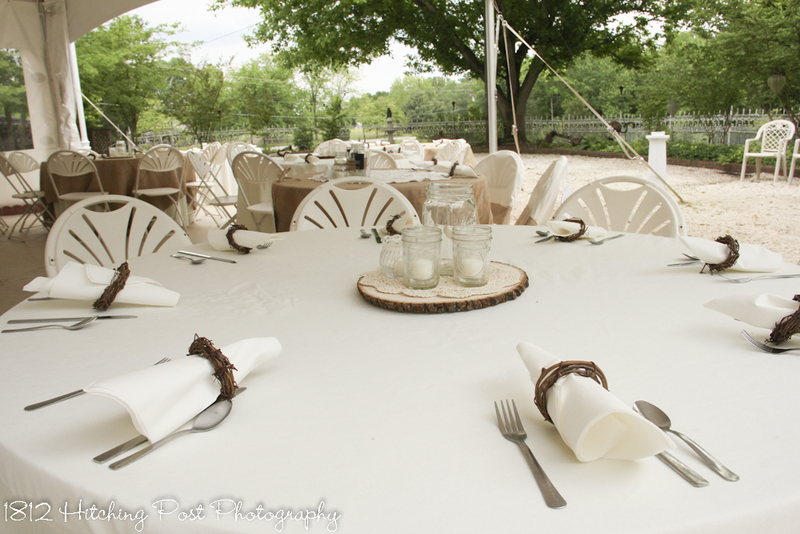 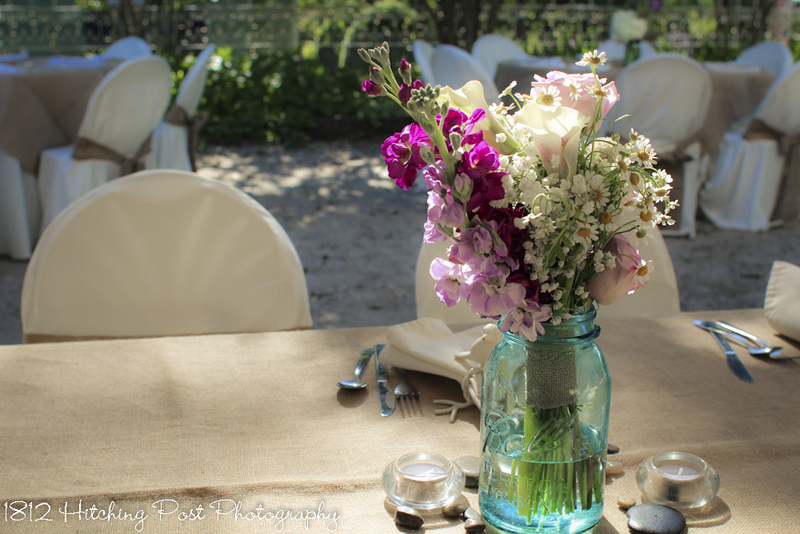 The 1812 Hitching Post provided the antique blue mason jars, burlap tablecloths and chair sashes, and tea light holders for the tables. 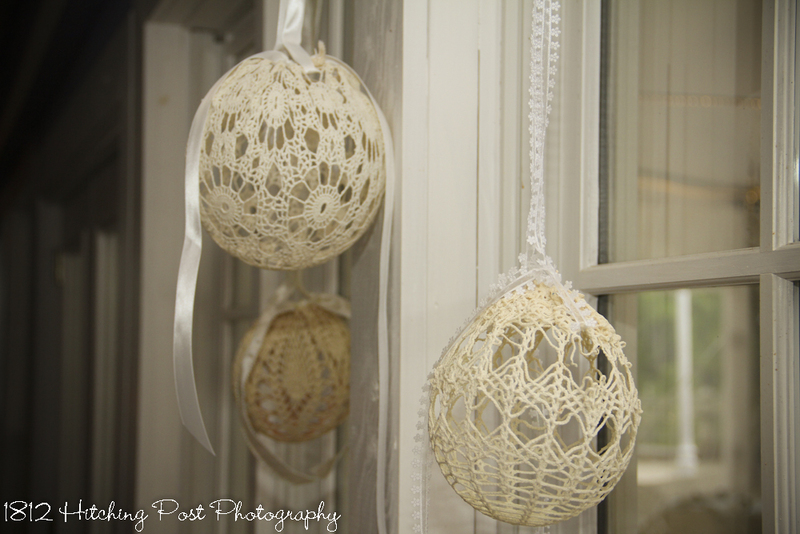 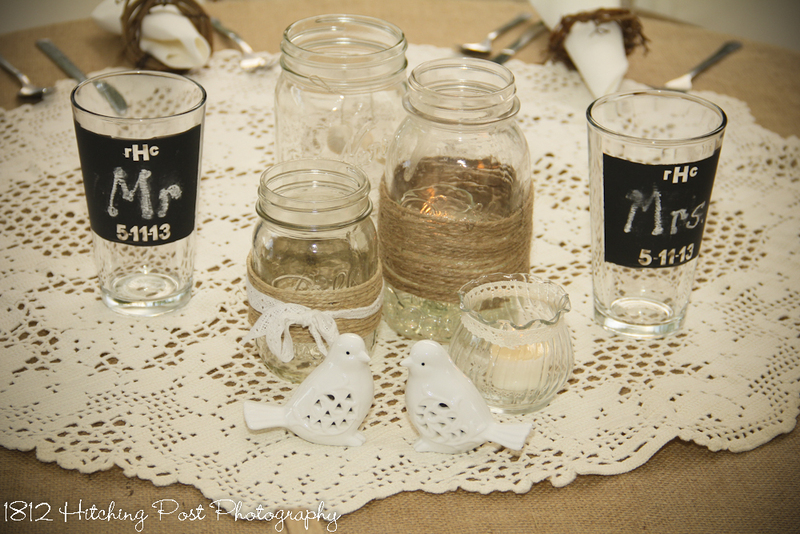 The mantles were decorated with candles, lace, and antique birds from our collection to go with the the theme. 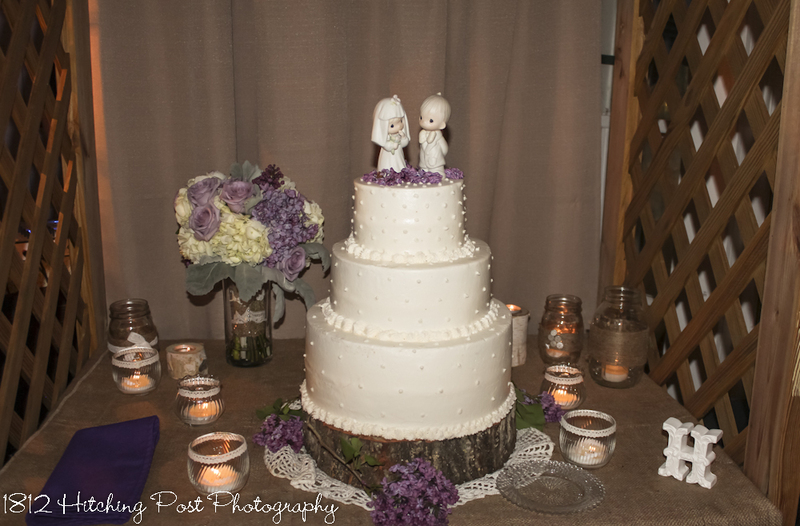 The cake was topped with wooden Mr. and Mrs. Lovebirds. 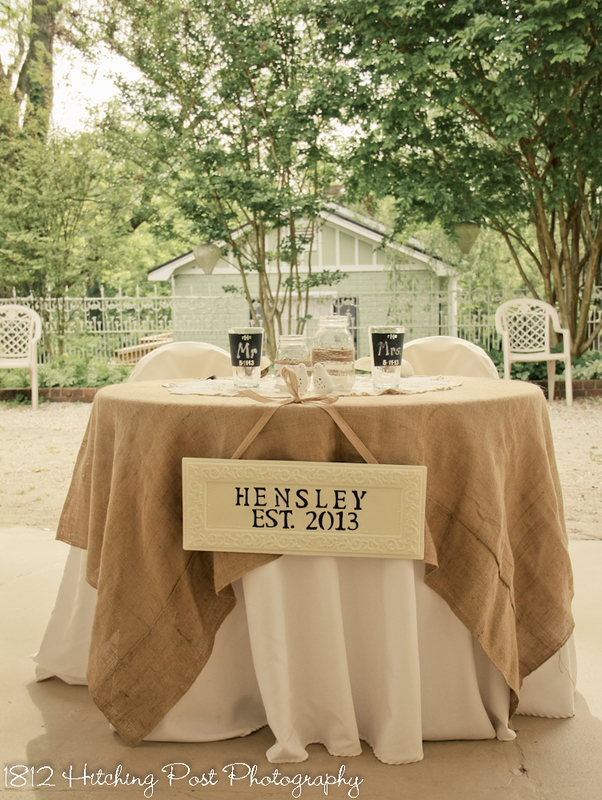 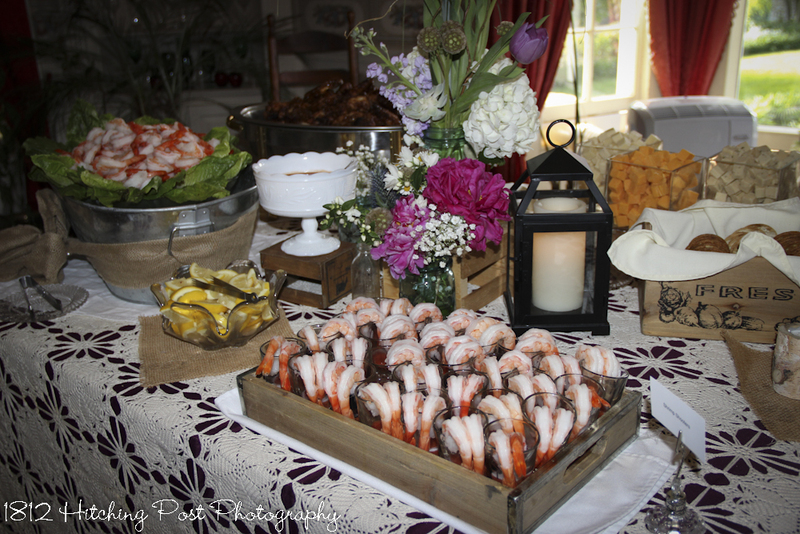 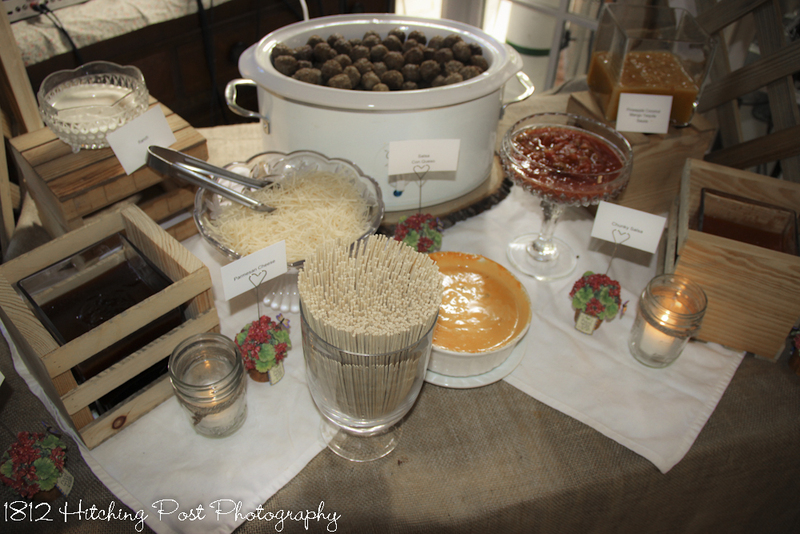 The couple’s menu included a meatball dipping station and a firepit with Smores bar. 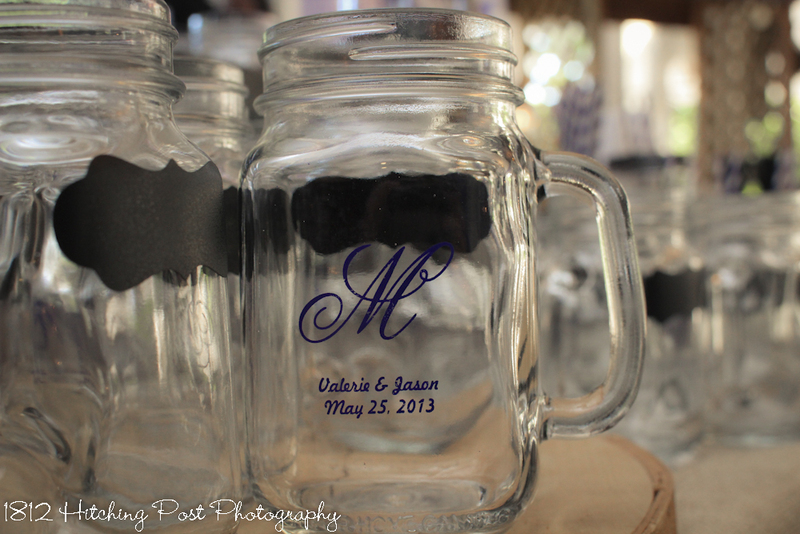 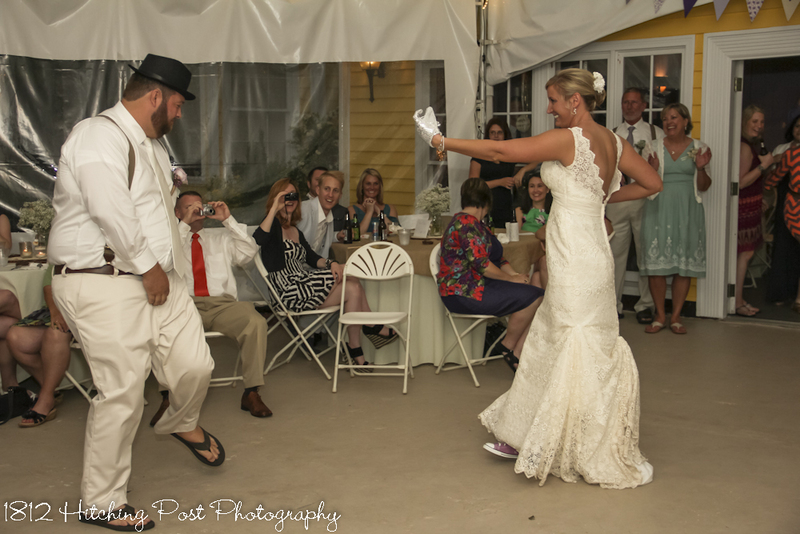 Baskets of flip flops were near the dance floor with a sign that said “Save Your Souls . . . . and Dance!” The couple’s party favors included mason jars with the wedding date and tiny chalkboards for the guests to write their names on the mugs. 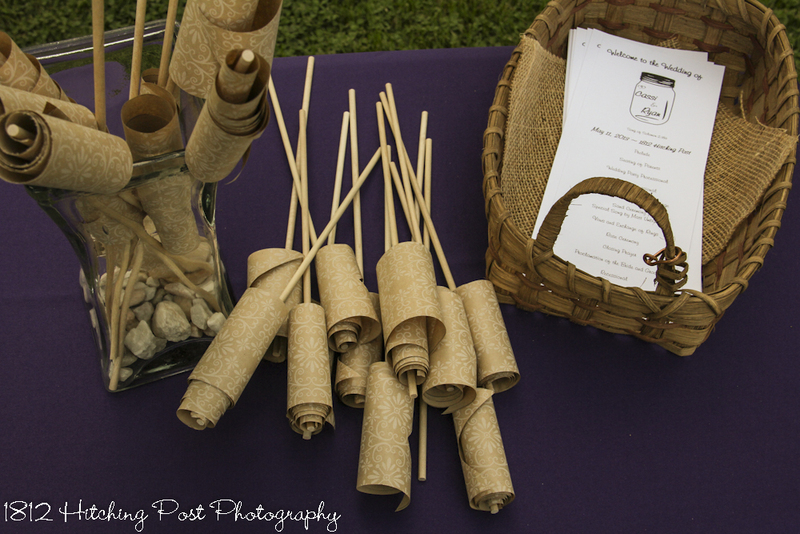 Purple and white striped straws added to the party. 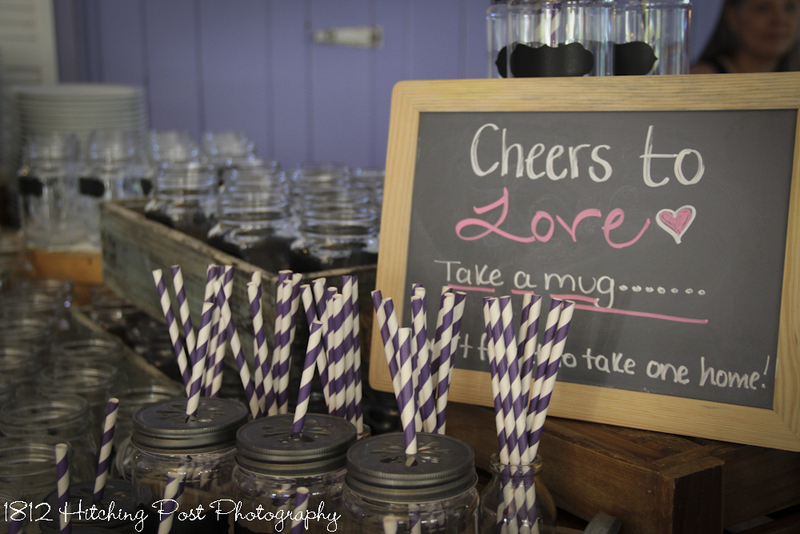 Cheers to Love; take a mug! 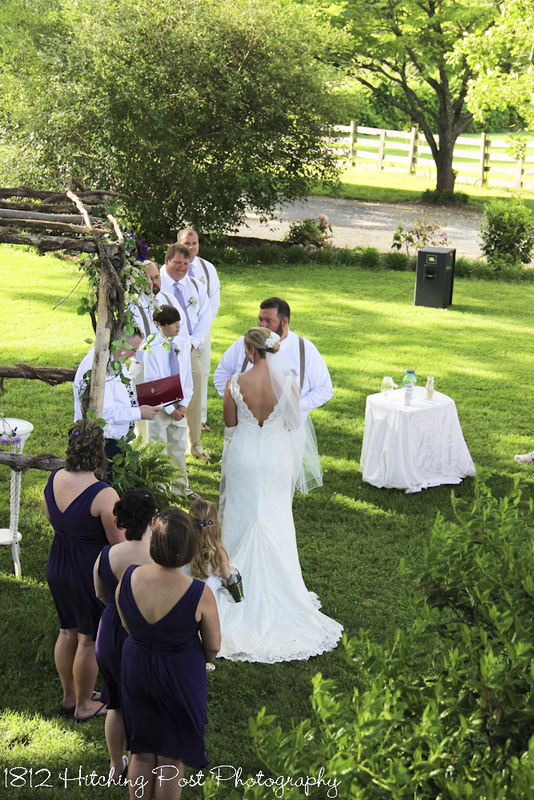 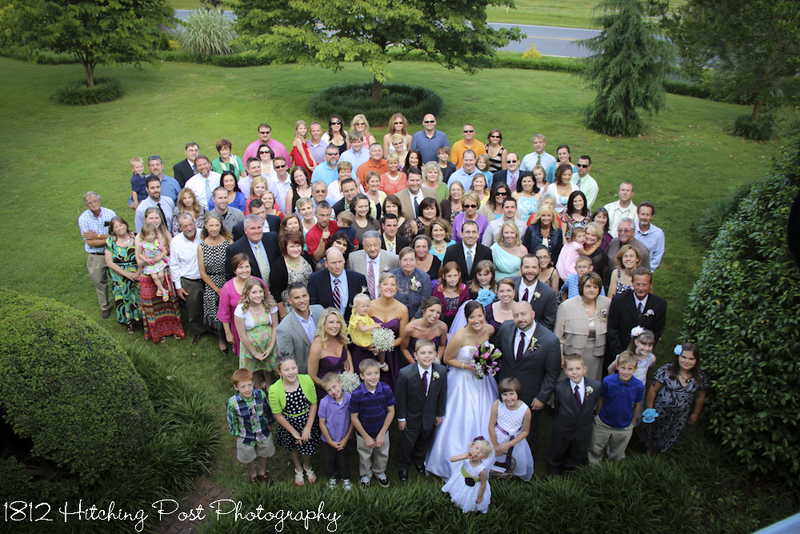 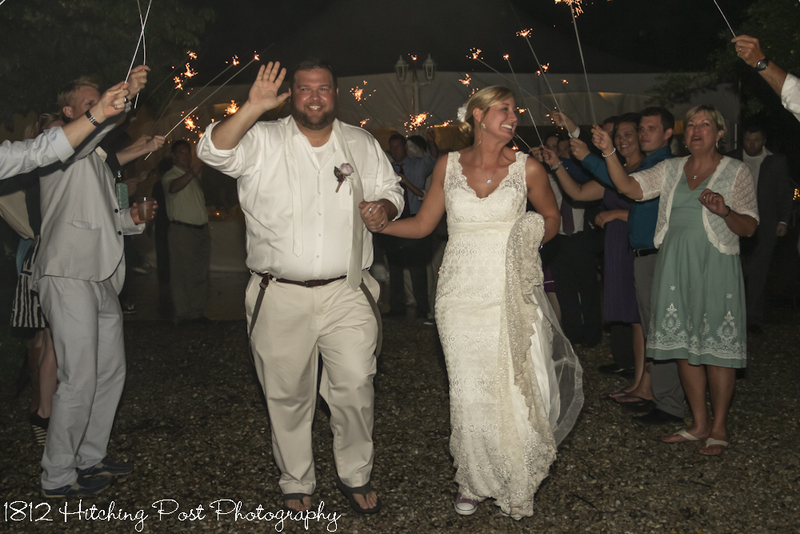 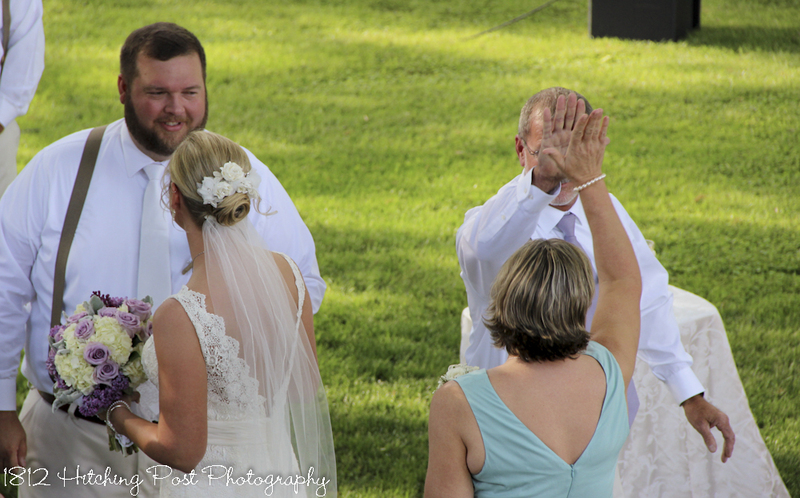 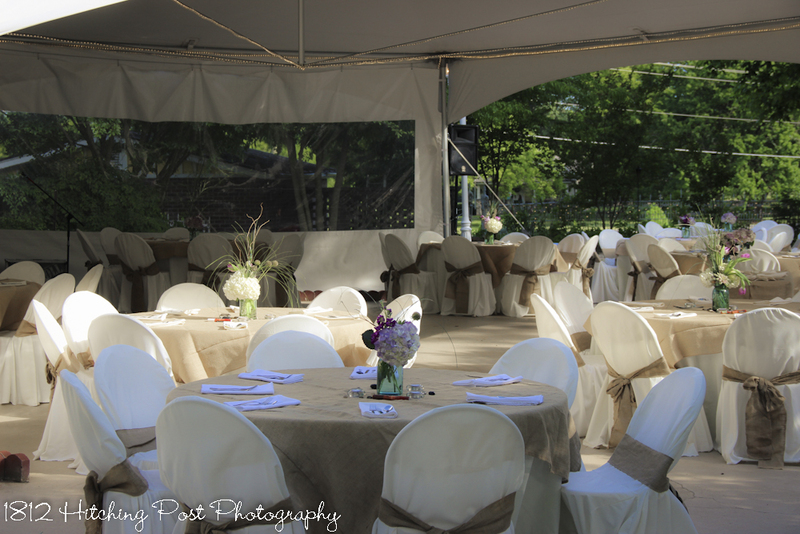 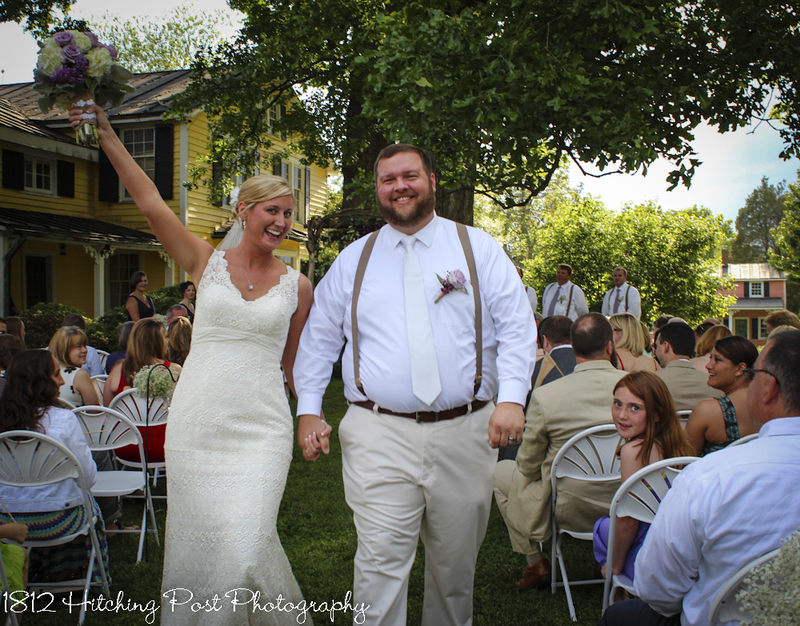 Cassi and Ryan choose the “perfect” 2nd Saturday in May to be married with about 110 guests in attendance. 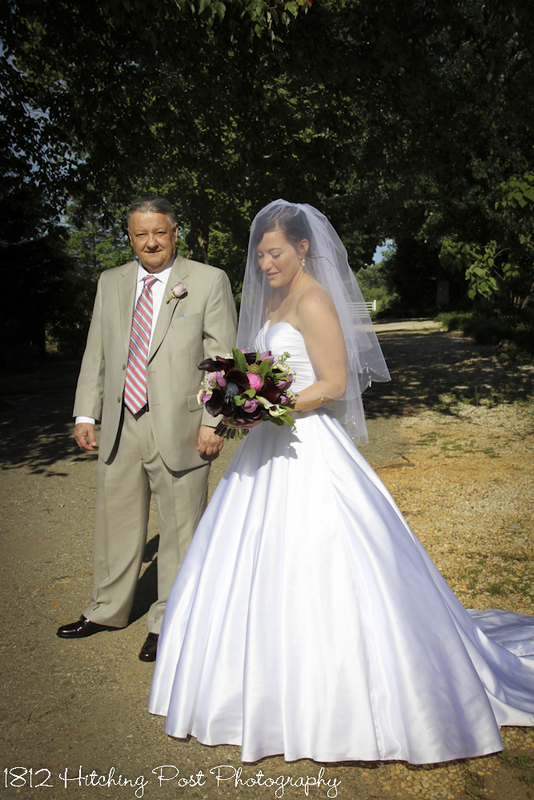 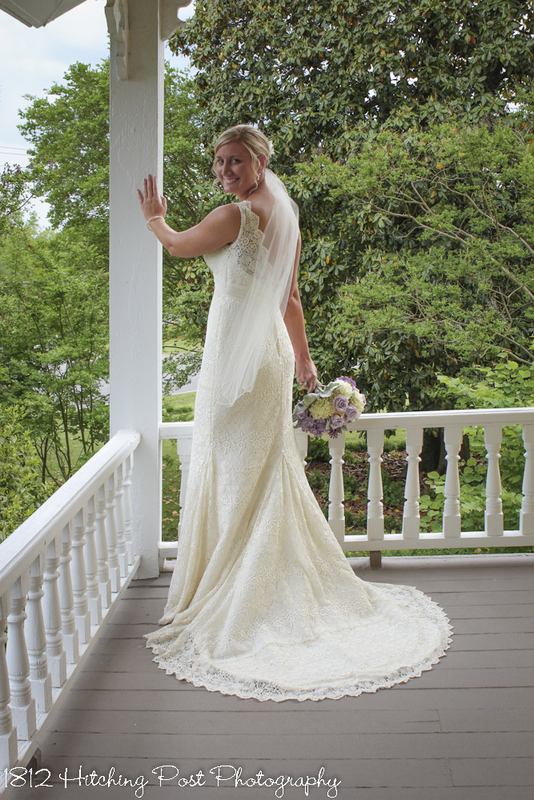 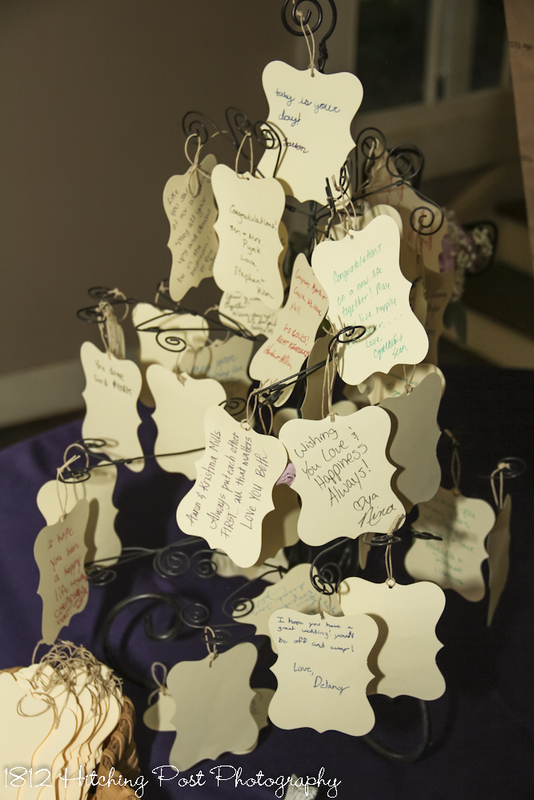 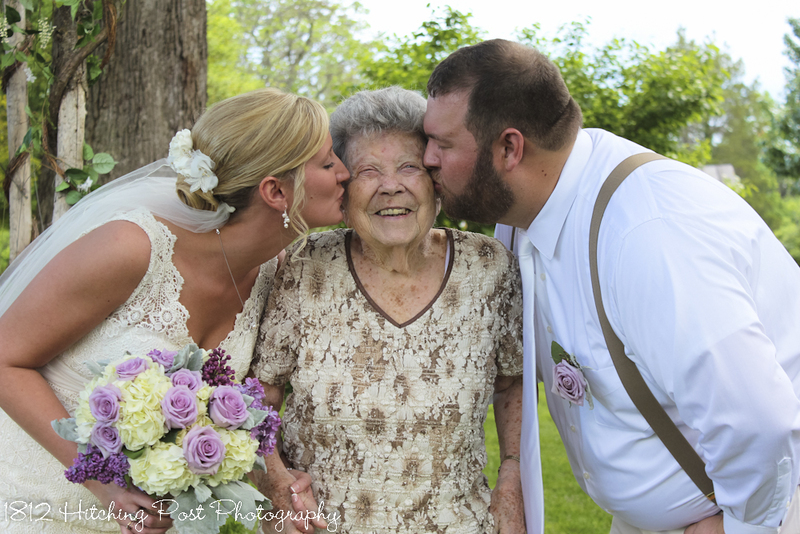 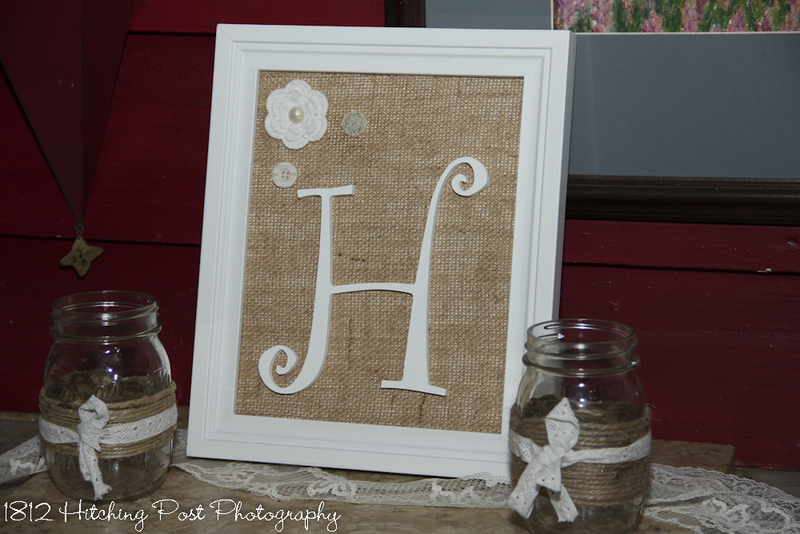 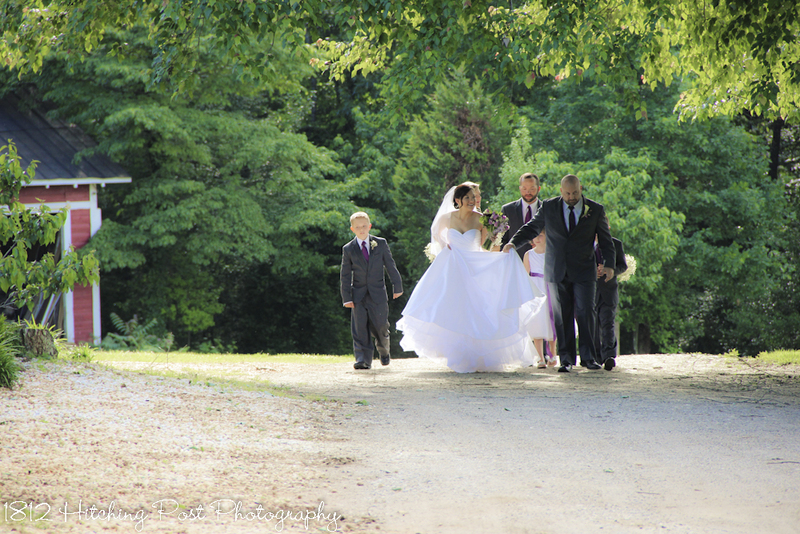 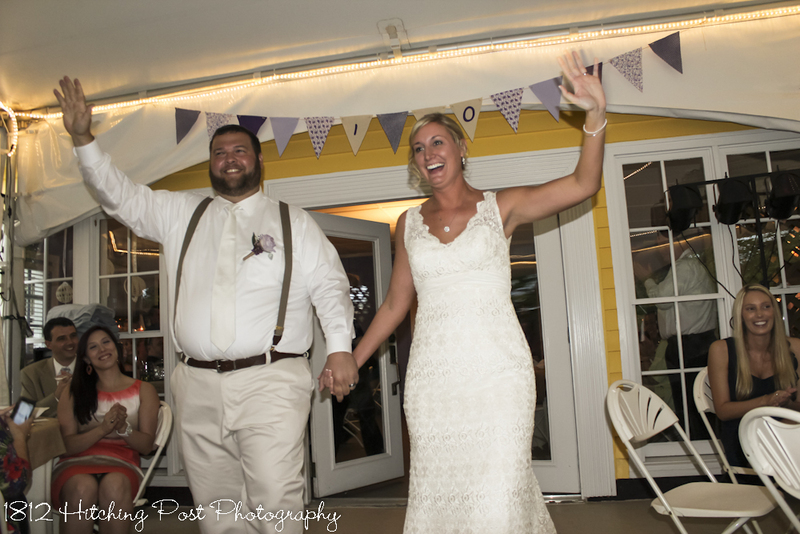 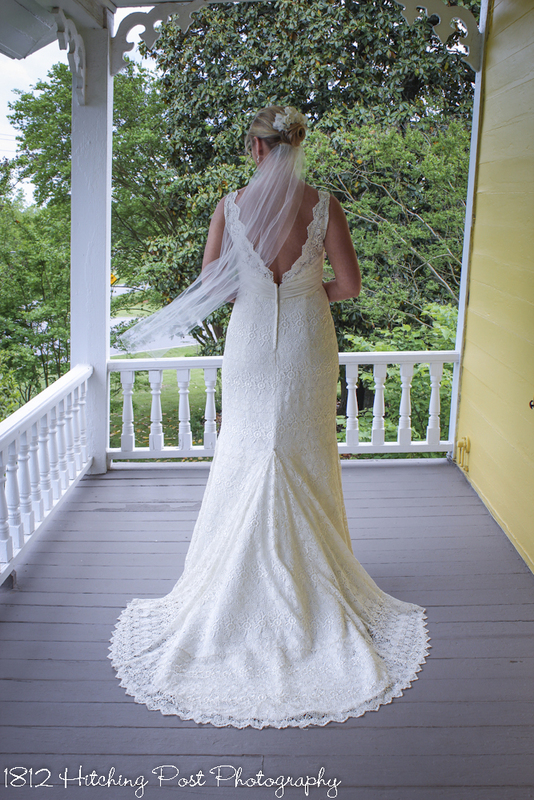 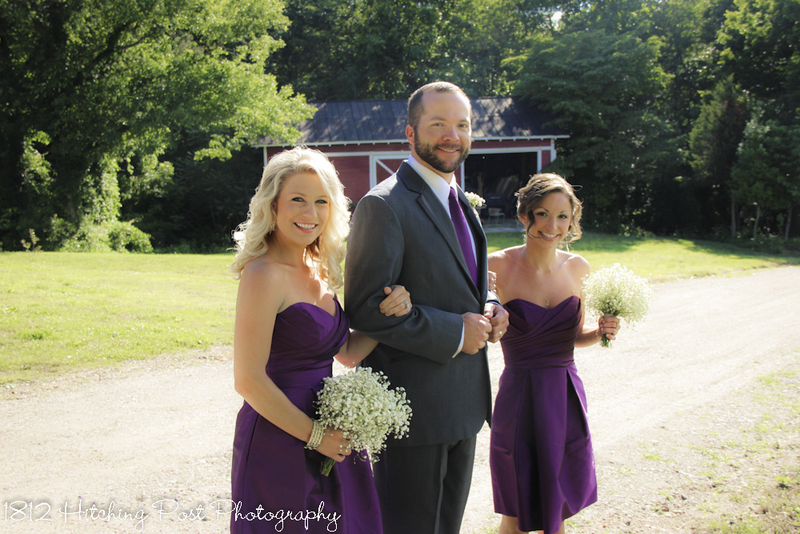 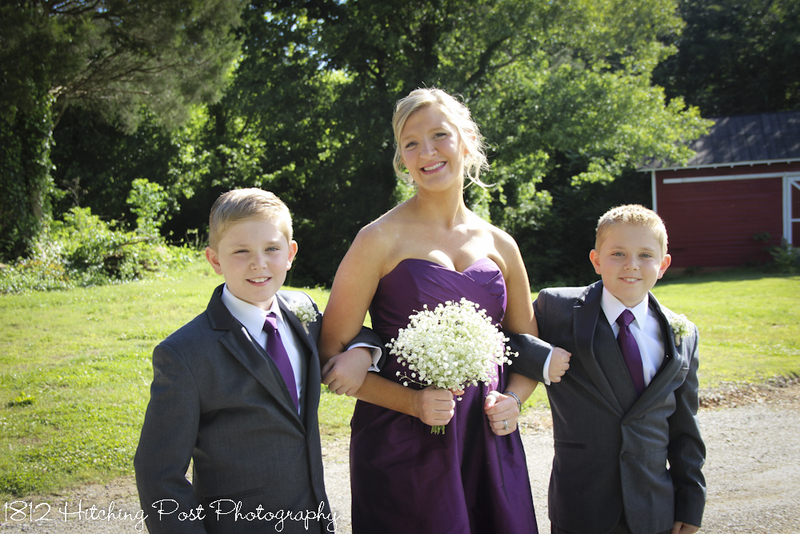 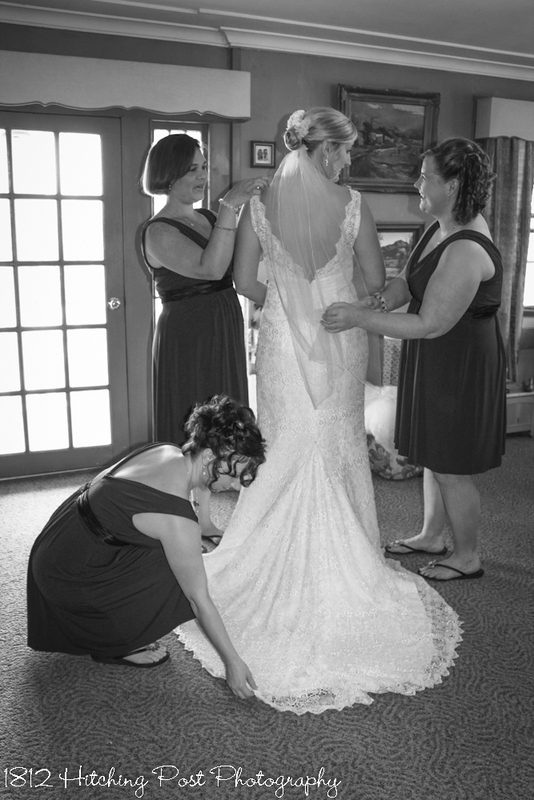 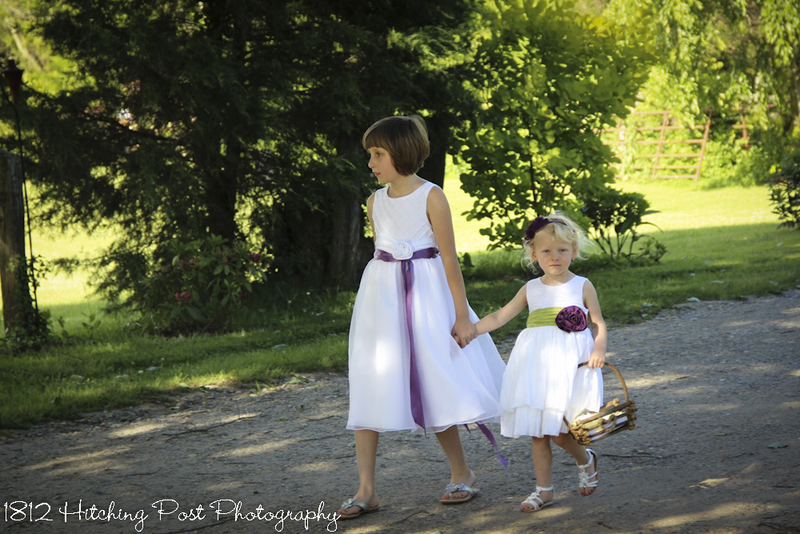 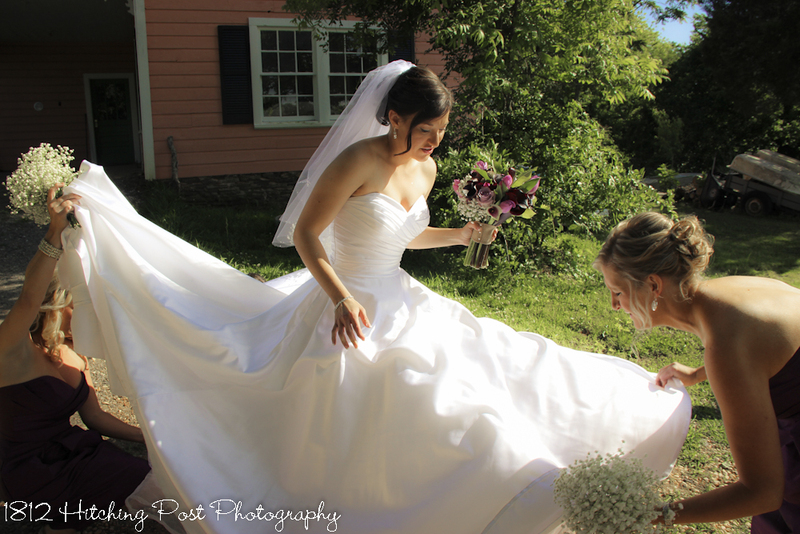 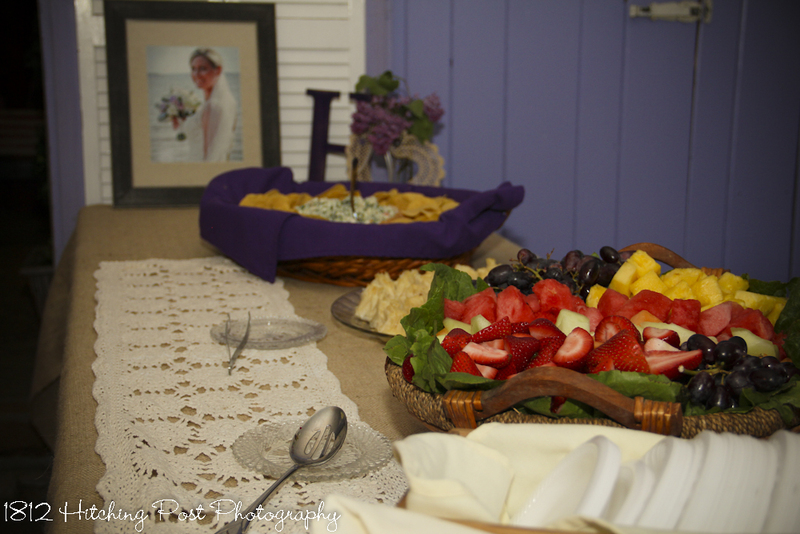 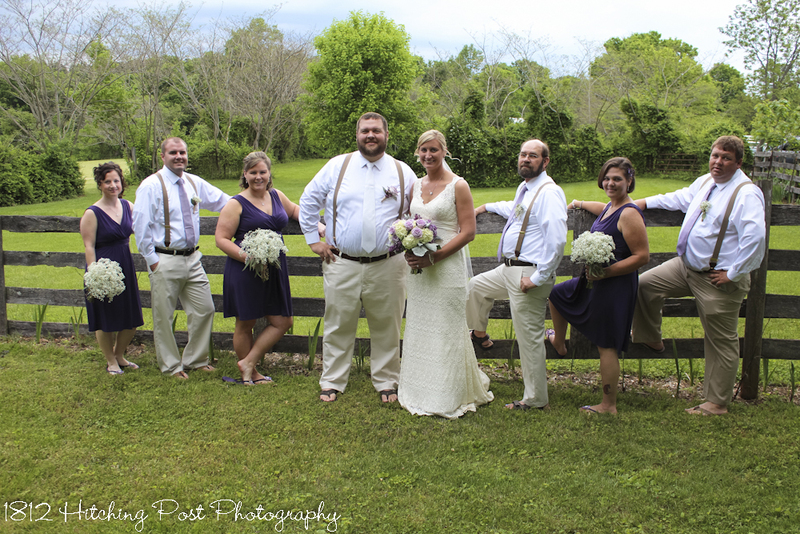 The primary colors used for Cassi’s wedding were burlap, lace, lilac, and deep purple. 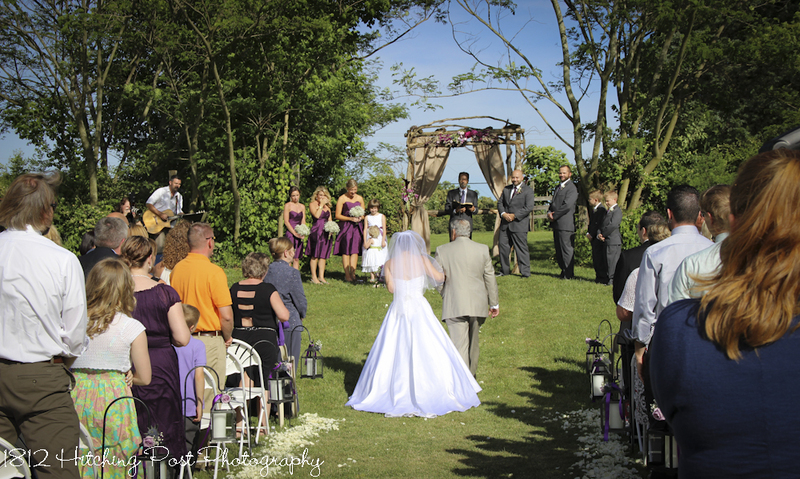 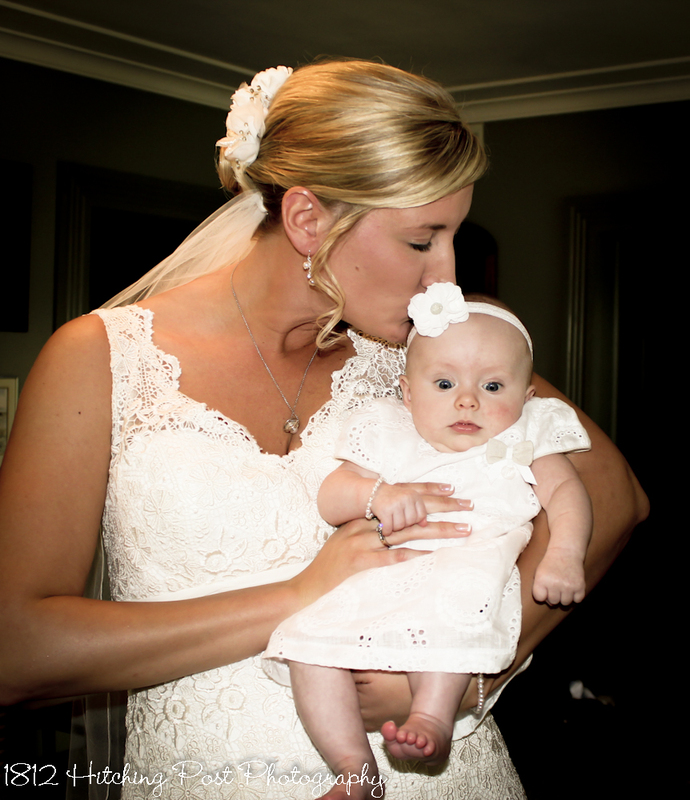 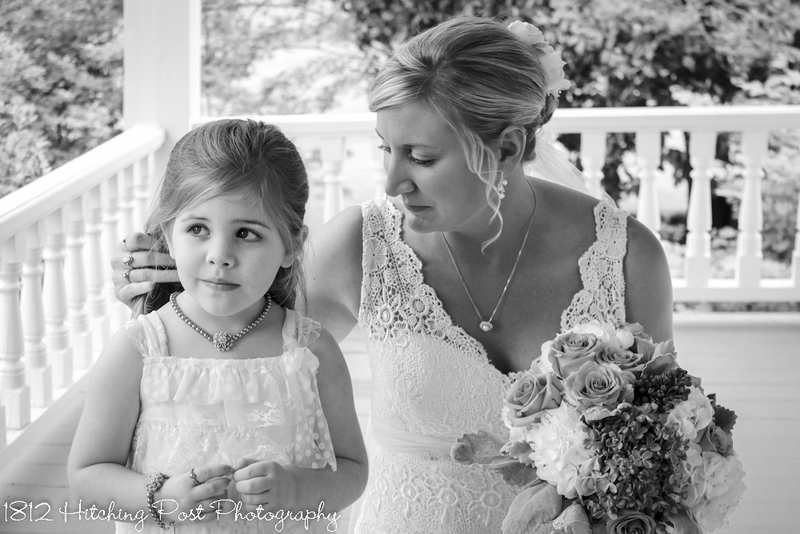 The wood arbor was decorated with romantic flowers as Cassi’s parents did a “high five” when they gave her away. 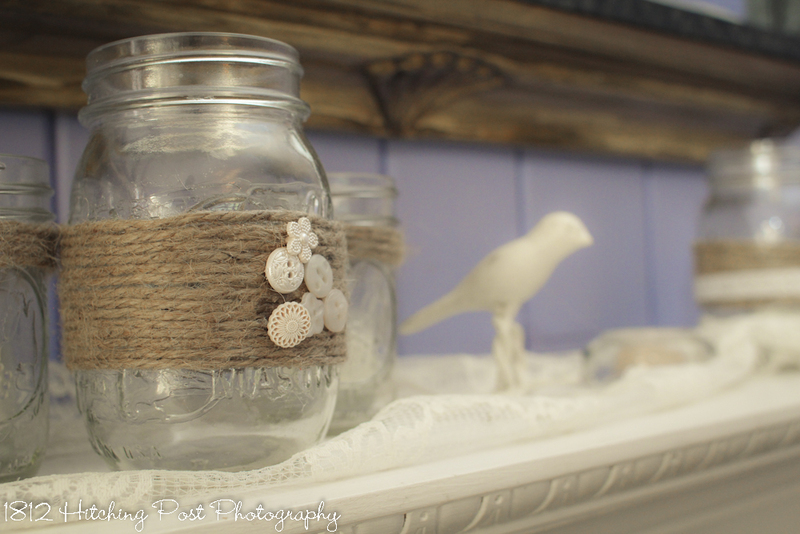 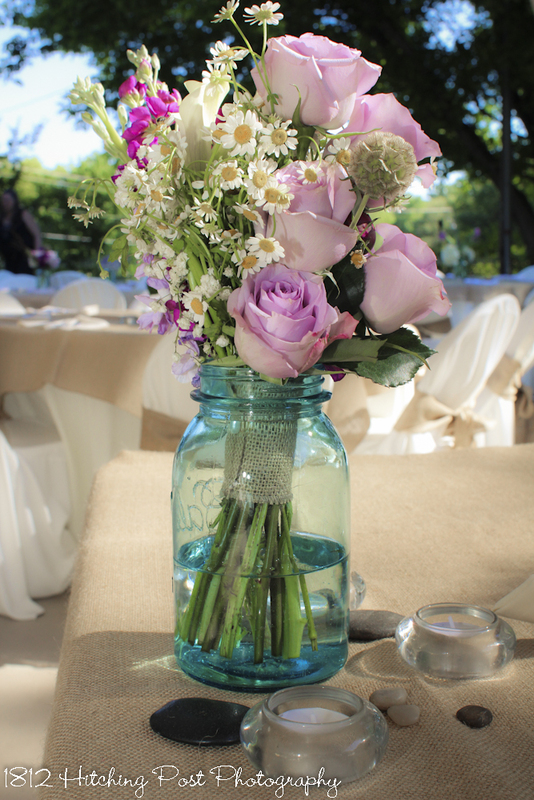 The aisles were decorated with mason jars filled with babies breath that were later transferred to the dining tables. 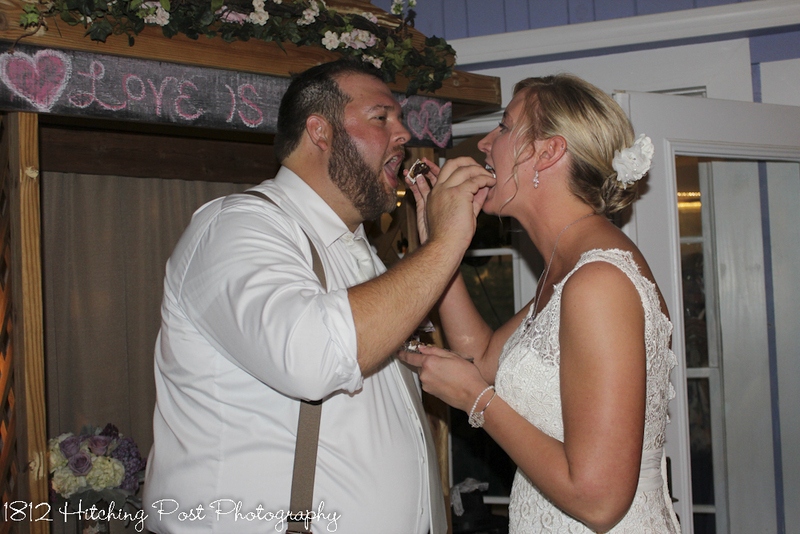 Cassi and Ryan chose marble cake with a simple polka dot design. 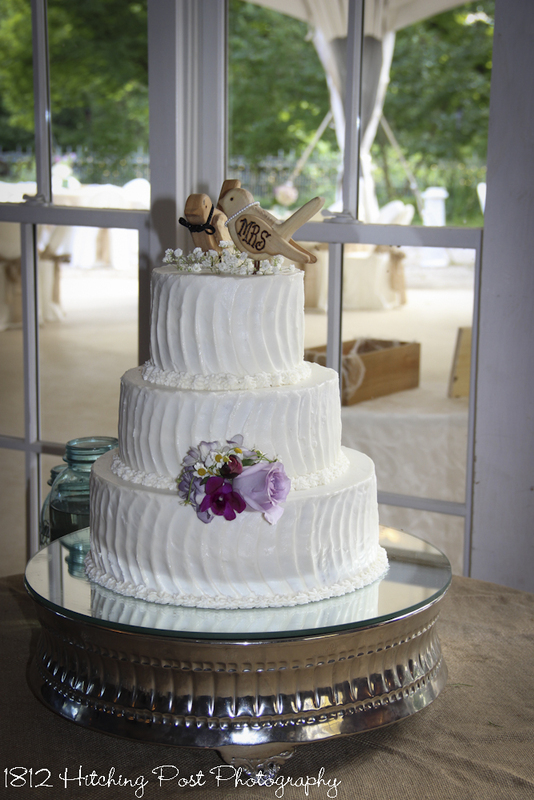 It was displayed on a rustic stand on a wooden slab for the cake base. 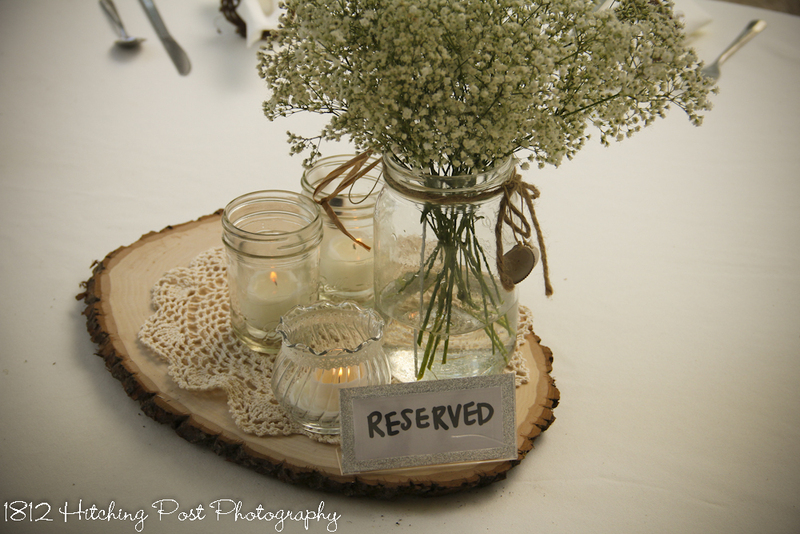 The tables were covered in burlap and topped with a wooden slab, mason jars with babies breath, bride provided lace covered candle holders. 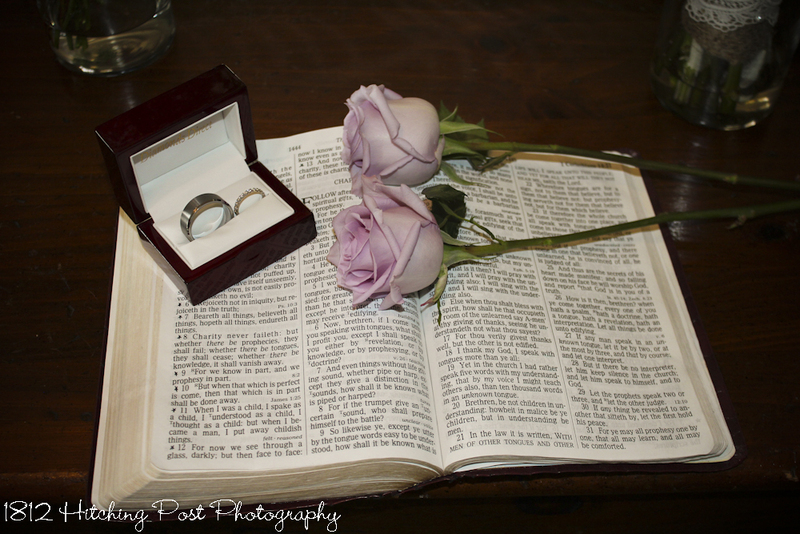 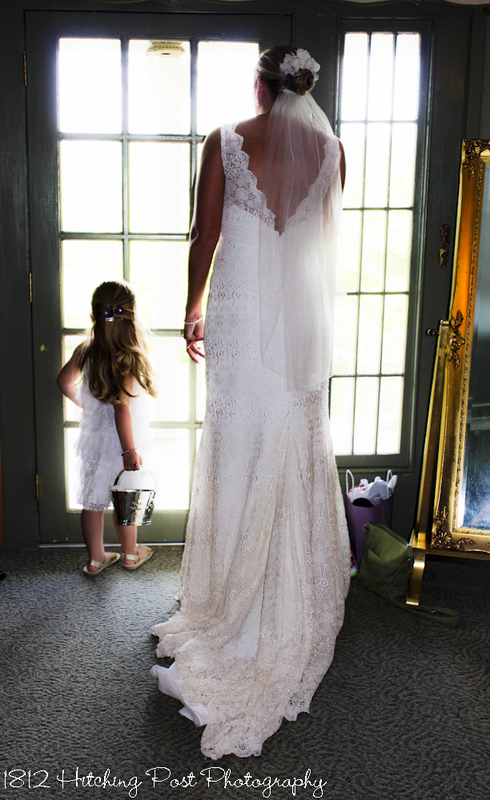 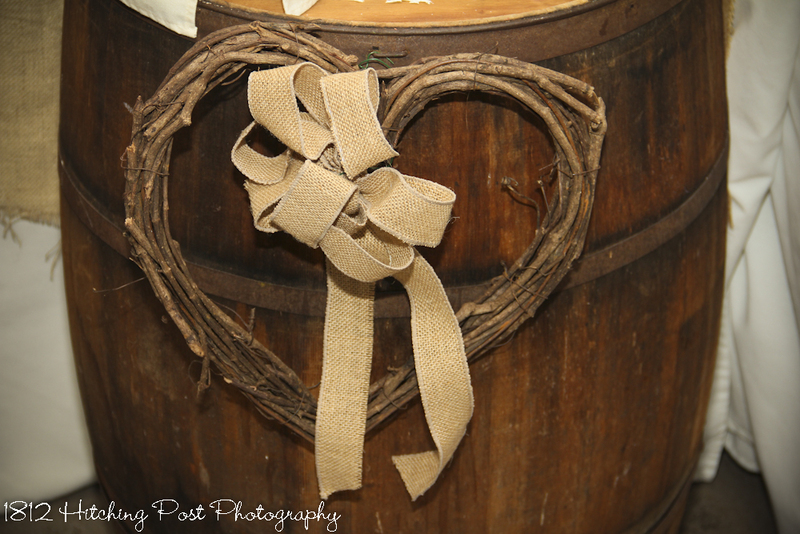 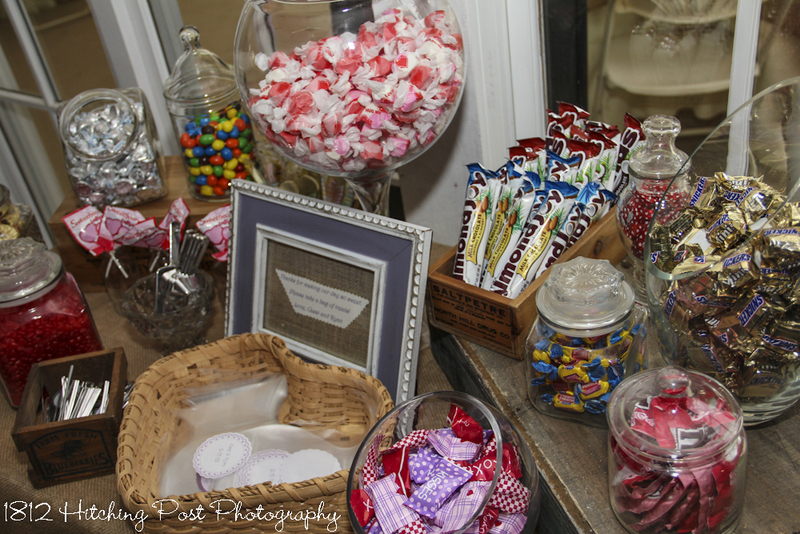 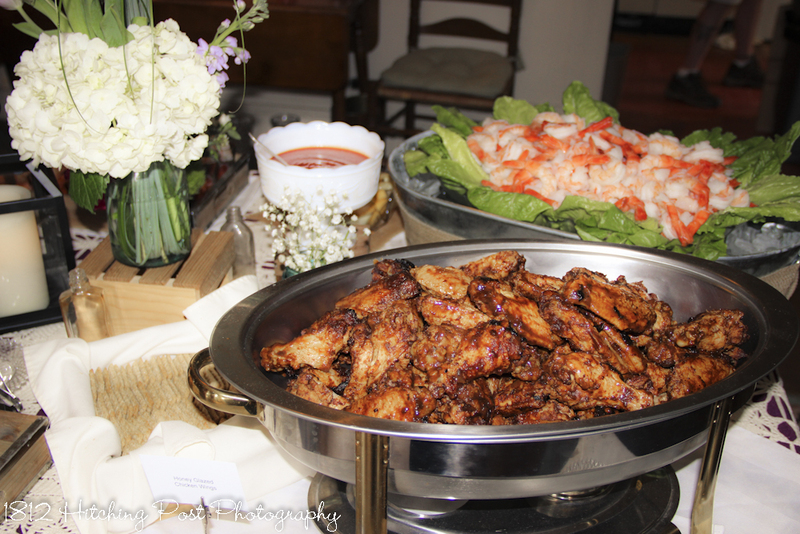 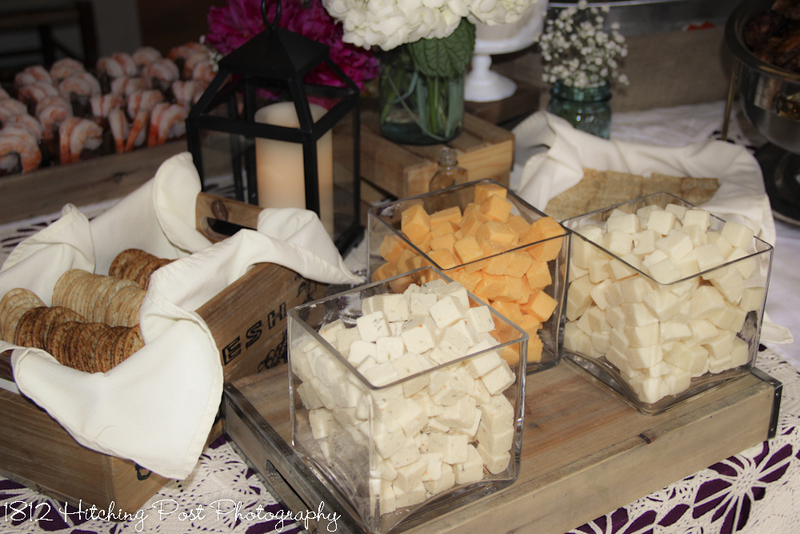 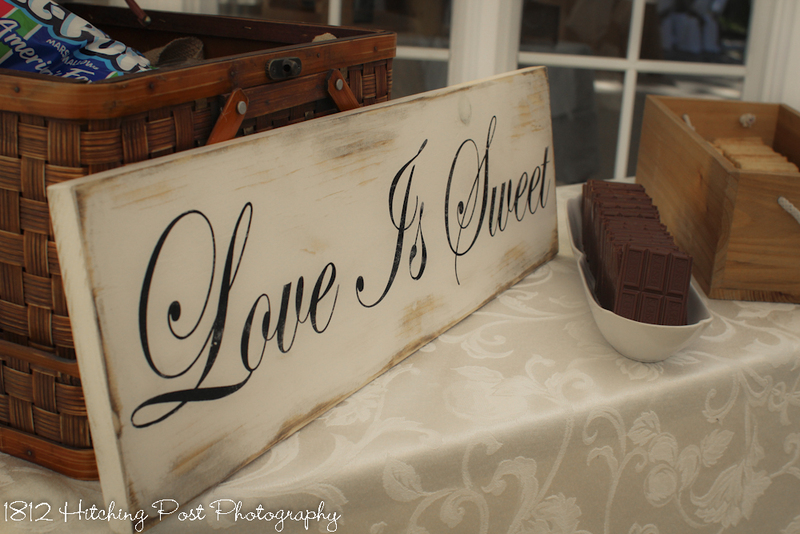 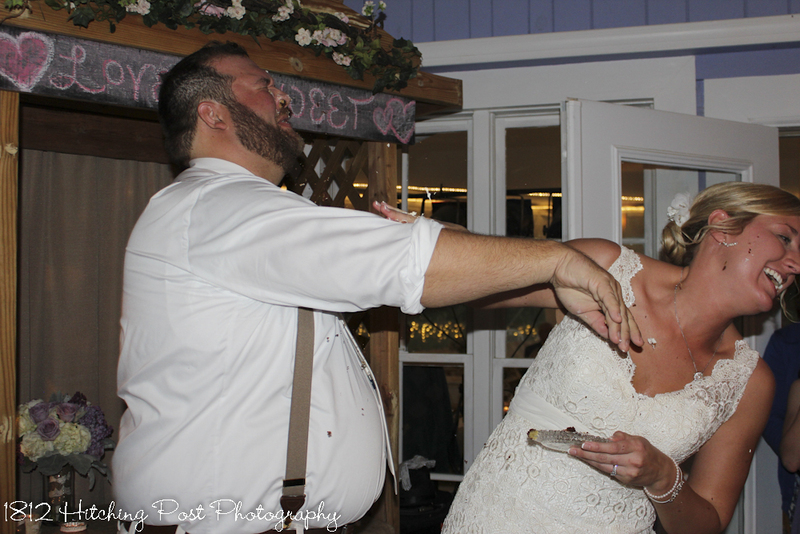 Family photos were scattered throughout the house and the couple provided a candy bar for their guests. 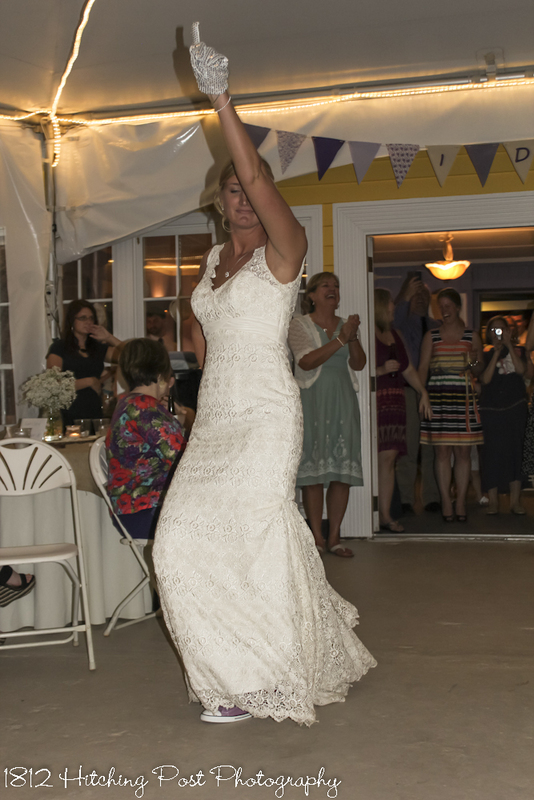 A highlight of the wedding was the couple’s first dance done to Michael Jackson’s “Thriller.” It was a thrill for all!